Is it OK that my toddler doesn’t like TV? Posted January 20, 2011 under Ask the Mediatrician. Q: My two year old has no interest in watching television at all, and my friends think it’s weird. Should I be concerned? A: No way! The scientific research we have to date supports your decision not to put her in front of an electronic screen until she turned two. Can I protect my kids’ media use at school? On the bus? Q: How do I protect my children against what I consider to be harmful media when they are at school or on the bus? A: Don’t leave this issue to be regulated by the bus driver, the other riders, or the school. Inform and empower your child to make sound media decisions for him or herself. Are 3D video games safe for kids’ vision? Posted January 18, 2011 under Ask the Mediatrician. Q: Are there are any vision worries we should know about when it comes to kids watching TV or playing video games–especially 3D ones? A: There’s little to worry about when it comes to how these 3D games affect young children’s eyesight. 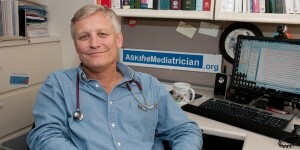 Posted January 14, 2011 under Ask the Mediatrician. Q: Are two year olds too young to see films like Tangled? What should I consider when thinking about taking my kids to the movies? A: If what you imagine her seeing, hearing, and understanding is what you want for her to experience, then take her and enjoy it together, keeping in mind these developmental considerations. How can I protect my child when she’s learning to use email? Posted January 11, 2011 under Ask the Mediatrician. Q: How can I keep my tween safe as she embarks on using email for the first time? A: Choose an email provider that fits your ideal, help guide your child as she’s starting out, and learn more about what issues she might face online–and how you can help her navigate them. How do I ensure that my wired kids are being responsible citizens offline? Posted January 6, 2011 under Ask the Mediatrician. Q: My kids are attached to their cell phones and laptops, and it worries me that they’re not paying as much attention to the world happening around them. How can I prevent this? A: Talk regularly about–and set a good example of–being a responsible citizen on- and offline. We’ve got tips to get you started.